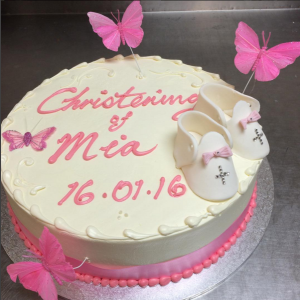 All Speciality cakes require 5-7 working days’ notice, view our Baptism & Christening gallery below and contact us for a quote. 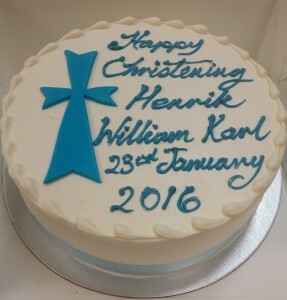 Buttercream Round Cake with a handmade Iced Blue Cross and Writing. This stunning cake is a double stack on the bottom and 1.5 on the top. The bottom tier is quilted with piped decoration. 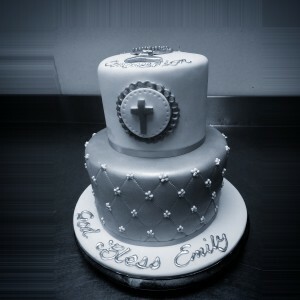 The top tier is decorated with an iced cross and chalice. This cake is best made from one of our mud flavours, top tier can be made from styrofoam if required. This 2 tier square cake can be made from any of our mud flavours: chocolate, caramel or marble. This cake is coated in royal icing and decorated with an iced bow, polka dots, stripes and a hand crafted elephant topper. 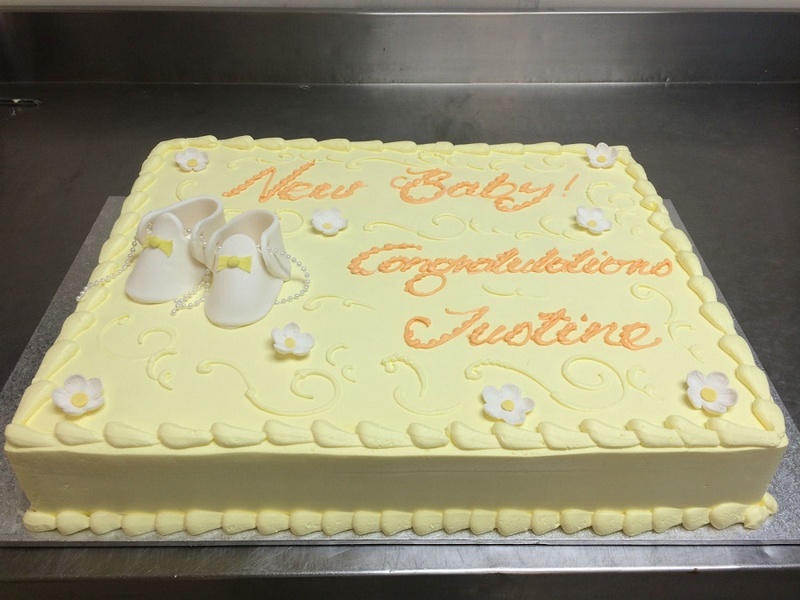 A popular choice to celebrate a new baby! This cake is a 24″ x 16″ slab cake that can be made from any of our sponge or mud flavours. With the option of buttercream or fresh cream, this cake is decorated with hand made iced booties and flowers with a piped border. The book cake can be made from any of our famous mud or sponge flavours. 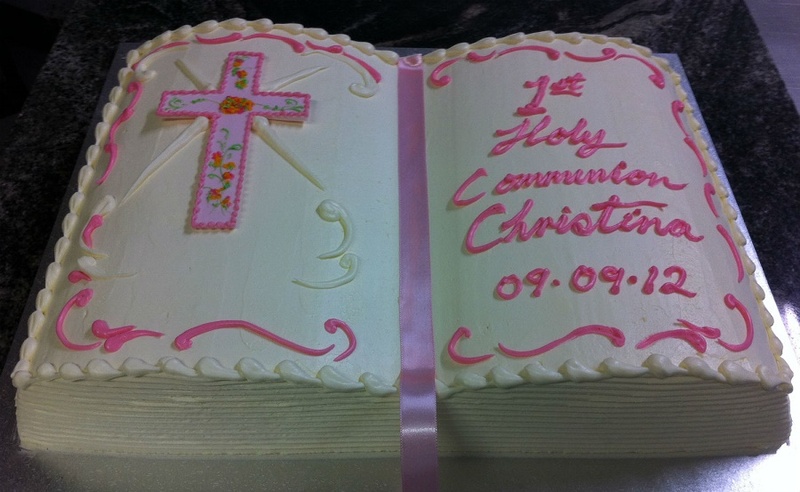 Hand shaped and iced with buttercream, a piped message of your choice can be written on the pages. 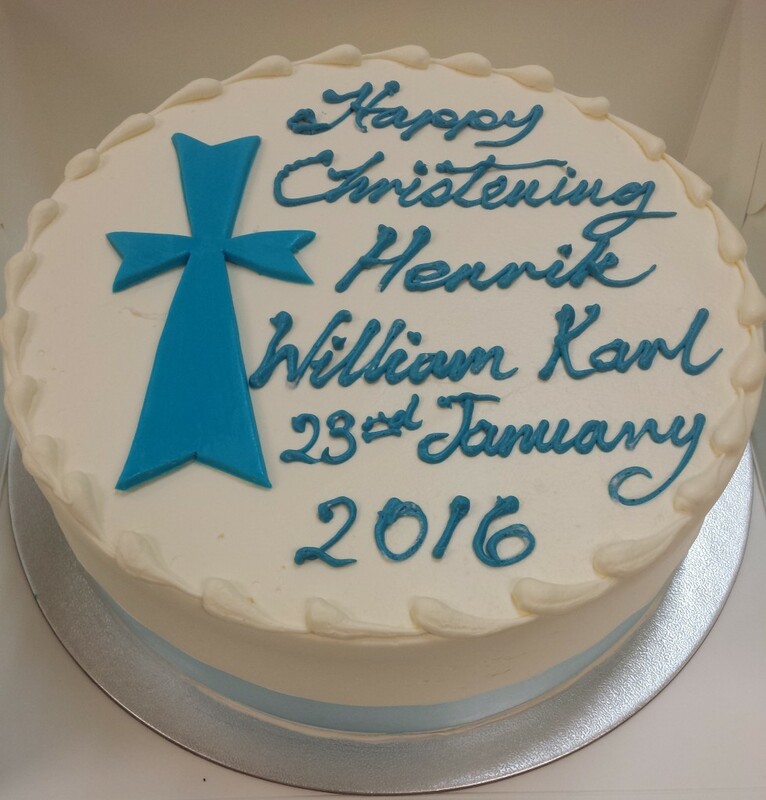 A cross can be made from royal icing or white chocolate. 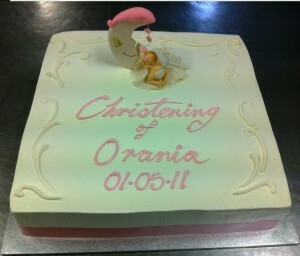 This 1.5 stack cake is hand carved into a pillow shape and iced with a quilted look. 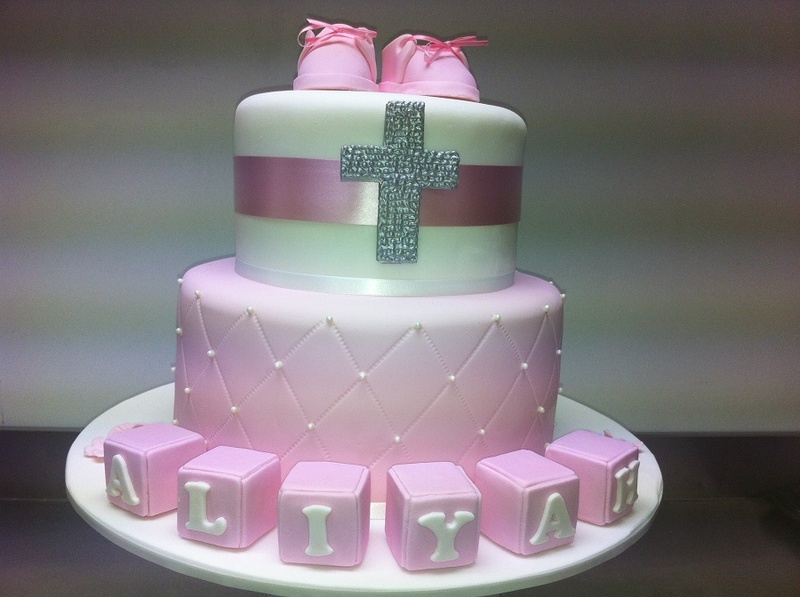 The cake is finished with diamantes on each square, iced block letters and hand made iced baby shoes and rattle. 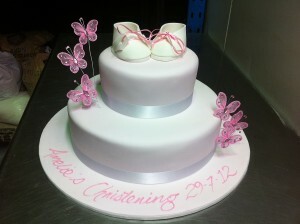 Round Buttercream Cake with Booties , Pink Piping, and Butterflies. Each tier of this cake is 1.5 stack, best made from one of our delicious mud flavours: chocolate, caramel or marble. The bottom tier is covered in 80 hand crafted ruffles, the top tier is iced with a quilted look. 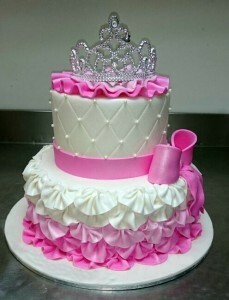 The cake is finished with an iced bow and a tiara. This 2 tier square cake is best made from one of our delicious mud flavours. 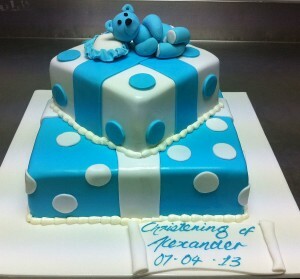 It os finished in royal icing with iced polka dots and topped with a hand made teddy bear. 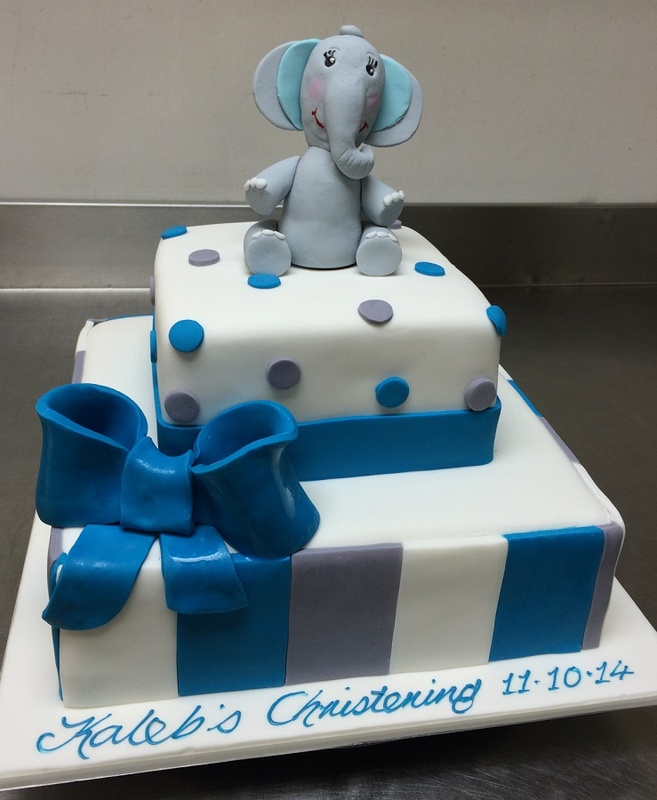 Best made from one of our mud flavours this beautifully simple cake is a 1.5 stack coated in royal icing. 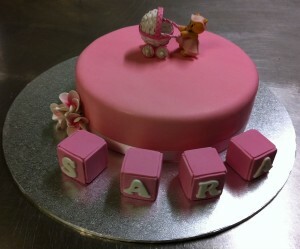 It is decorated with a stroller cake topper and hand made iced letter blocks. This 2 tier cake has a quilted bottom with hand piped dots. The top layer is finished with a ribbon and a diamante cross. The cake is decorated with hand made iced baby shoes and block letters. This simple 2 tier cake is coated in white royal icing with white ribbon and fabric butterflies. 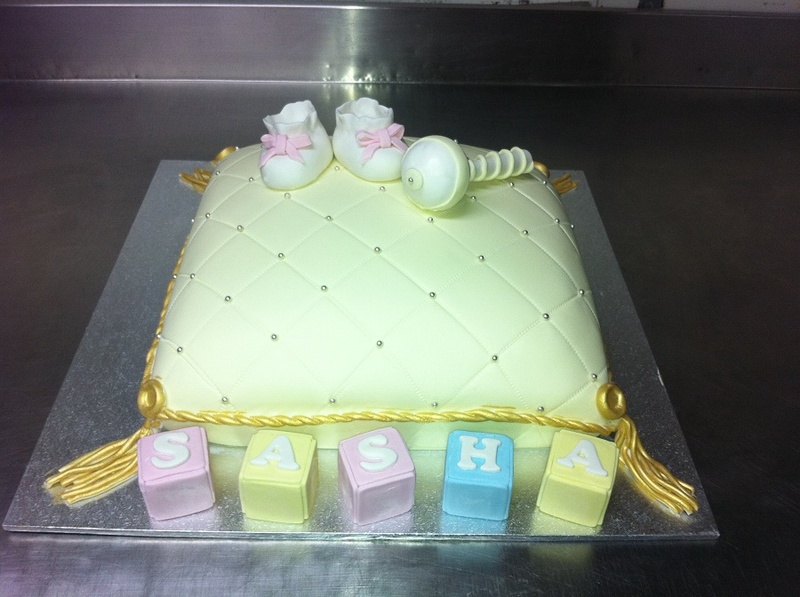 It is topped with a pair of hand made iced baby shoes and is best suited to one of our famous mud flavours. Buttercream Square Cake decorated with pink piping and ribbon and decorative ornament. 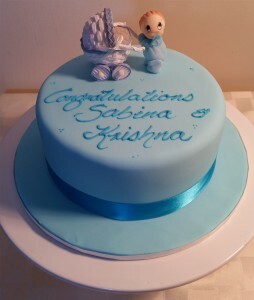 Iced Baby Blue 7” Cake with Blue Ribbon, with an Iced Baby Blue Board decorated with a decorative ornament and writing. 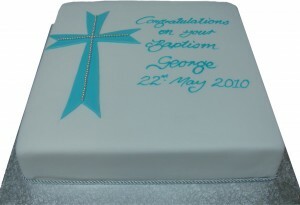 Iced Square Cake decorated with a handmade Iced Cross and diamantes and writing.